DVDs for both the student and the teacher. With a 100% unconditional, no time limit money-back guarantee, you can order with confidence. This seminar on DVD for the teacher is the place to start. Includes everything you need to teach writing to your students. 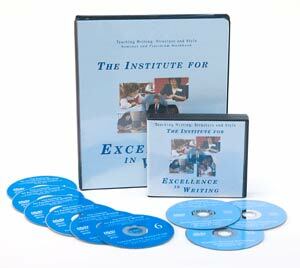 Excellence in Writing offers a line of student courses on DVD for many grade levels. Start with a Student Writing Intensive, continue with the Continuation Course, and prepare your student for both the SAT and college with the High School Essay Intensive and the Advanced Communication Series. Most of these courses Free lesson plans. If you have the teacher’s course and would like ready-made lesson plans with sources for your student, here they are! Choose from various historical and subject themes. Multi-graded for ease of use. Free permission to copy within one classroom. 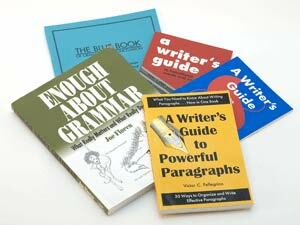 Excellence in Writing also has many aids for writing including grammar, citation references, and more.